It was only years later that I truly knew who was just three feet away from me in the Ochoa Dojo. 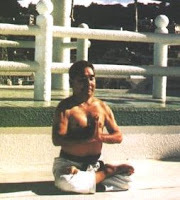 Seikichi Toguchi, founder of the Shoreikan school of Okinawa Goju-Ryu Karate Do, visited Puerto Rico in the mid to late 70's. Very short, even by Puerto Rican standards, dark complexion, and round like a basketball. I was told (never confirmed) that the sunflower seed-eating welcoming committee at the airport were stunned to zazen silence when they saw him alight Havana cigar in hand to greet them. Later that night (I was told) a scotch on the rocks was added to the props among the chosen few. They had mopped the floor with us a week before to razor sharp Sanchin state to avoid any dojo embarrassments from the white belt rabble. I even washed "my dirty old Gi" and backstitched a few errant tears, alas to no avail as I was told to hide in the back rows. So one more reverence was added to the beginning of the class. I had never seen the senseis so uptight. Just in case, they ran a watered-down version of our normal exercise routine to keep us fresh for the katas. It was then that he jumped out of his zazen and walked around the class, effortlessly gliding around punches and kicks to correct a wrist here, straighten a back there, and with just a finger push back brown belts to test their balance. A young female brown belt caught his eye. She was as small as him. The girl had the lowest shiko dachi in captivity, enough to elicit an appreciative smile. Then came the best part for us white belts: the humbling of the sensei. Master Toguchi sat on the floor in a half lotus as the black belts attacked him one by one. They became like dolls in his hands as he flipped one this way, another that way. I don't know how he did it, it all went by so fast. This was no staged show, for the first time in the dojo I saw Gusi sensei sweat. It took me many years to fully grasp all I saw that day. His calmness, deftness of touch, the girl brown belt, the sensei's dumbfoundness. This was a man who had practiced Goju practically all his life, it was his very skin. The girl, I suppose, was himself young. The sensei's fate, my fate; some things are fanthomless. I realize now that I could not "know" him then. NowI know, but cannot do. Recently I caught an old sensei of mine smoking. Why? I said nothing. I've become zen in my old age: I look and say nothing, marvelling at the twists and turns of life. I remember he did a basic kata and it looked classic. It was distilled through time, aged in amber. But I did not know this then. Now...maybe too late, I have an inkling, just that. Ochoa Recap 4: Gone is the Goju of Yesteryear?